Complete the online Chabad Youth Enrolment form 2015. This form manages the legally required information for childcare purposes such as your personal information, information about your child and certain authorisations. It is a mandatory pre-requisite for booking into the program. Please note, this is not a booking form. You only need to be complete this form once in the 2015 calendar year. 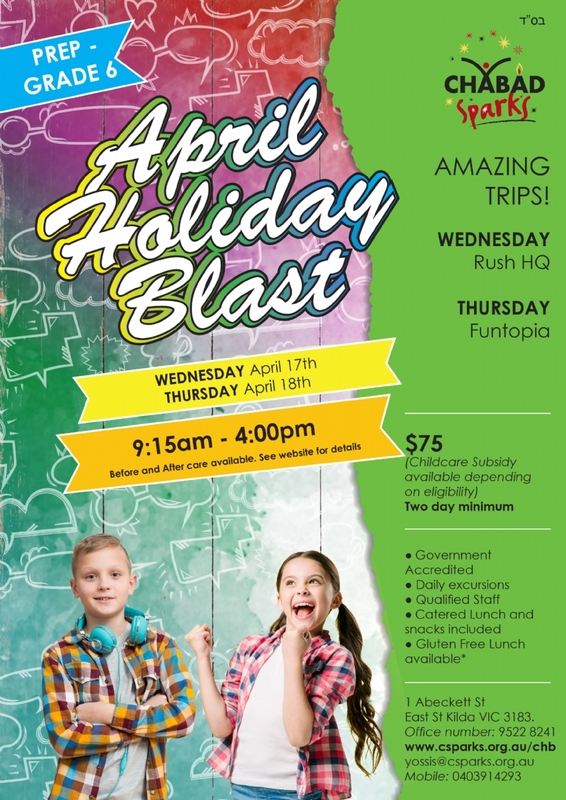 If you have already completed this form in 2015 for Chabad Sparks Holiday Blast, Camp Ignite, Tuition or Chabad Youth clubs then there is no need to complete it again. Email a copy of your child's immunisation record to didi@csparks.org.au OR Mail to Chabad Sparks, 1 A'Beckett Street S.Kilda East, VIC 3183. This only needs to be sent once in the 2015 calendar year. Complete the online Holiday Blast! booking and payment form. This form manages your child's booking for the Holiday program.